Stuffed mushrooms are one of my favorite hot appetizers. I've collected an impressive assortment of recipes for them and, over time, you'll probably get to see them all. However, today I'm only going to feature one. I chose this one to serve over the weekend because it's so easy to do, and, when you're into day four of a long weekend, easy assumes an importance it might otherwise not have. I think the original recipe, found here, was developed by Giada De Laurentis, but I found another that is similar in an online book, called Almost Italian, which is a compilation of recipes and stories from Italian immigrant communities across America. Those of you who love Italian food might find the book really interesting. I know I did. I've changed the recipe slightly to avoid waste. I've included finely chopped mushroom stems in my stuffing and changed the herb mix a bit. I think the mushrooms help keep the stuffing, which can be dry, moist and I replaced the mint, which I found to be off-putting, with additional parsley. Here's my version of the recipe. 1) Heat 1 tablespoon olive oil in a frying pan. Add chopped mushroom stems and cook just until softened, about 3 minutes. Stir in garlic and cook until fragrant, about 15 seconds longer. Remove from heat and cool to room temperature. 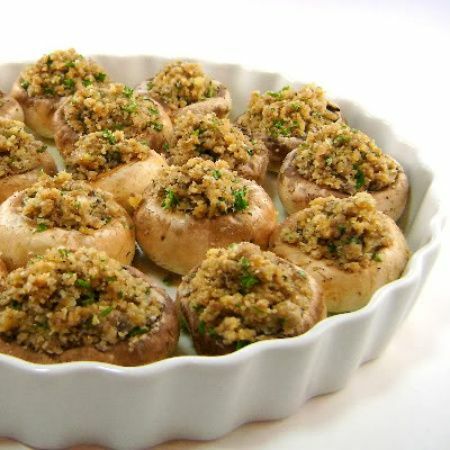 2) Preheat the oven to 400 degrees F.
3) Add 2 tablespoons olive oil, bread crumbs, cheese, parsley and salt and pepper to taste to mushroom mixture in skillet. Mix with a spoon to blend. 4) Coat bottom of a large baking sheet with about 1 tablespoon olive oil. Spoon filling into the mushroom cavities and arrange on baking sheet, cavity side up. Drizzle remaining oil over filling in each mushroom. Bake until mushrooms are tender and filling is heated through and golden on top, about 25 minutes. Serve immediately. Yield: 7 servings. Honey Walnut and Brie Tartletts - What's Cookin, Chicago?